Sapphire windows, Sapphire lenses, Sapphire blanks. Sapphire windows are ideal for vacuum chambers, submarine and other harsh environment applications. We provide sapphire windows and sapphire lenses according to customer's specifications. Please contact us us for quotation of your Sapphire windows or lenses. Our Sales Team will prepare an answer within 24 hours. If you do not see a suitable size in catalogue, write a request, we will make Sapphire windows according to your drawing at no additional cost. 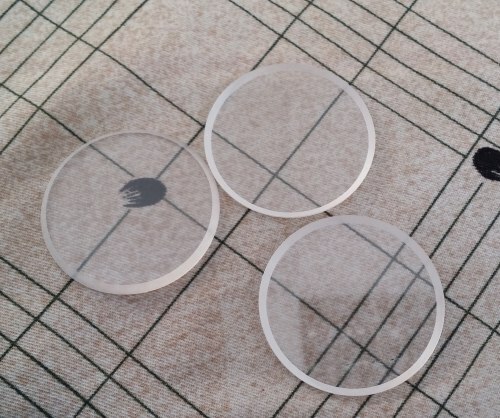 The largest dimensions of Sapphire window - Diameter 100mm. Rectangular Sapphire windows are also available. Sapphire is used for windows in 250-5000nm wavelength range. It is recognized as a highly important optical material because optical grade sapphire combines high transmission with outstanding mechanical-strength properties at high temperatures. Sapphire windows can be made thinner than alternative crystals thanks to its structural integrity and can operate up to 2030⁰C. Sapphire windows are widely used as protective windows or viewports. Sapphire windows are ideal for applications where high pressure, vacuum, or corrosive atmospheres are a consideration.